Djibouti is a small and easily overlooked country seated on the rim of Africa's horn - a much frequented pit-stop for vessels passing in and out of the Red Sea, but not often ventured into by the average tourist. This is unfortunate because Djibouti has some rare qualities that abundantly reward the intrepid visitor, with plenty of adventure sports to try and unusual landscapes to explore. Large parts of the country's interior sit within the Afar Depression, a region lying 500 feet (155m) below sea level that is rich in ancient fossils and one of the hottest places on Earth, with temperatures reaching 118°F (48°C). 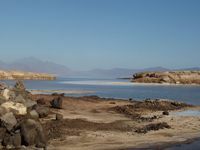 Lake Assal, 75 miles (120km) south of Djibouti City, is the lowest point in Africa and the water steams at an unswimmable 93°F (34°C). The pressure underneath fissures around the lake cause fantastic plumes of steam to hiss out of the surrounding plateau. Most of the country is desert with no arable land, crops, irrigation, or forest. The interior is mountainous in the centre, filtering down to the coastal plain on the east and the arid plateau in the west. Any ventures into the interior have to be conducted in a 4x4 vehicle. For those looking to get out of Djibouti City but not travel too far, the beaches at Doralé and Khor-Ambado provide warm waters for swimming and exotic marine life with which to dive. Around two thirds of the country's citizens live in the capital of Djibouti City, while the rest live just as residents of the country have for centuries - as nomadic herders. There is no real industry in the city, or the country, but a large informal market economy thrives. For visitors looking to spend a few hours in the city, the Central Market, the Stade du Ville (national stadium), Presidential Palace, and Hamouli Mosque are all worthwhile stops. But getting around is not cheap; the lack of infrastructure and regulation means that taxis are expensive. Unlike the country's neighbours Ethiopia and Eritrea, Djibouti enjoys political stability and a relatively safe atmosphere. The British Foreign Office advises against all travel near the border with Eritrea, but otherwise Djibouti is a peaceful and unique place to visit.